Adopted a user-centered process to combine competing websites. Before I joined CRS, the organization had structured its digital presence in a way that reflected its org chart. 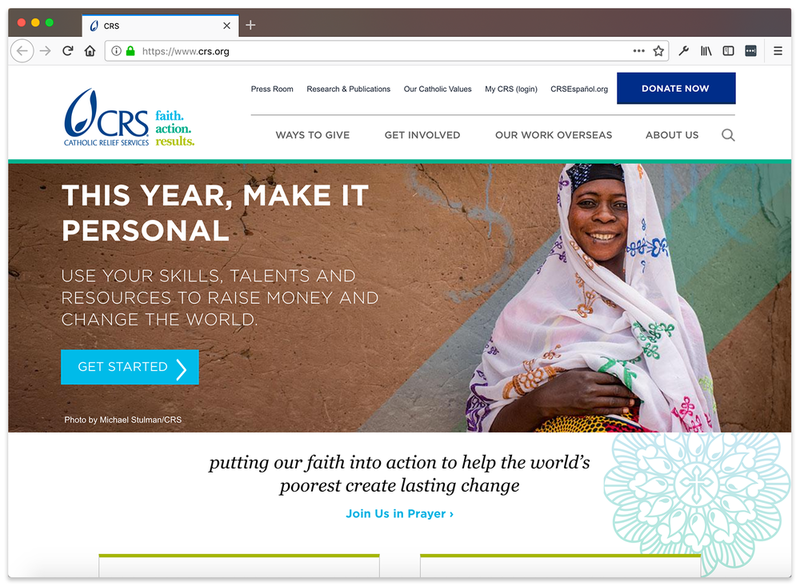 There were two main websites: crs.org, which targeted US Catholics, and crsprogramquality.org, which targeted donor institutions, partner NGOs, and researchers. I was on the team that managed the latter site. Our mandate was to produce technical publications that would help practitioners in our industry while demonstrating the organization's expertise. About 70% of CRS's revenue came from the donor organizations that crsprogramquality.org served. These audiences didn't understand why they should have to leave the organization's main site in order to find the content that they needed. We conducted interviews, surveys, and analytics to gain insights about what types of content audiences truly valued and how they wanted to access them. We learned, for example, that users needed some manuals as PDFs that they could take overseas to rural areas with limited internet access, while certain chunks of content that existed only in fact sheets, briefs, and brochures would be far more useful as HTML in topic pages. Meanwhile, some of the marketing materials in our library were making it harder to find and trust the site's peer-reviewed research materials and tools. At our recommendation, CRS decided to merge crsprogramquality.org's content into a redesigned crs.org. I managed a user-centered process for our division's part of the transition. With support from an agency partner, we conducted stakeholder interviews, surveys, a competitive analysis, a heuristic evaluation, and card sorts. We developed personas, conducted a content audit, established content types, created wireframes, and contributed to the information architecture. Some personas (left) and a wireframe (right) from the redesign. I led content curation, preparation, and migration for our division's portion of the redesign. This included establishing guidelines and processes, which I applied before the migration to determine what content to keep, revise, and delete. The redesign made it easier for the organization’s biggest donors and partners to find the information they needed. The process also played an important role in breaking down silos to advance the organization’s mission. As a result of this cross-divisional collaboration, three colleagues and I created the organization's first content strategy team. The team’s mandate was to better coordinate efforts between departments while working with executives on foundational content strategy issues—a major step forward for the organization. The homepage after the redesign.